Are you a regular air traveler in the US? If so, you might miss a flight or two this summer due to long lines at airport security checkpoints. The Transportation Security Administration (TSA) is working hard to solve the problem, but don’t expect it to go away overnight. 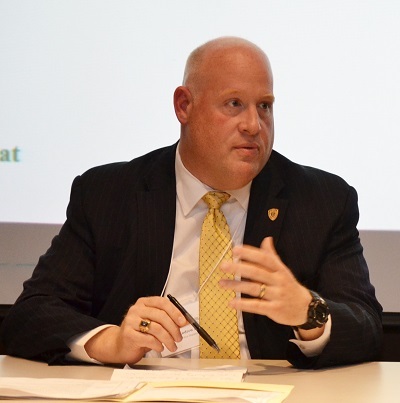 On April 28, TSA Chief Risk Officer Kenneth Fletcher told participants at CCICADA’s 7th Annual Research Retreat, held at Rutgers University, that a dramatic increase in the number of passengers is challenging the ability of the TSA to screen all passengers in a timely fashion under existing security procedures and protocols. In an ironic twist, the TSA one month later fired one of its top security executives after 500 passengers missed their flights in a single day at Chicago O’Hare International Airport due to long lines. Unfortunately, the TSA’s decision to remove security executive Kelly Hoggan and hire hundreds more security screeners and their sniffing dogs at busy airports is a temporary fix at best. The problem, as Fletcher explained at the CCICADA retreat, is that the number of air passengers is growing much faster than the physical ability of airports to inspect those passengers. The solution that Fletcher and the TSA are pursuing is to move away from screening all passengers as equal risks and to develop “intelligence-driven” security protocols that use data analytics and other modern tools to reduce the pool of risky passengers. 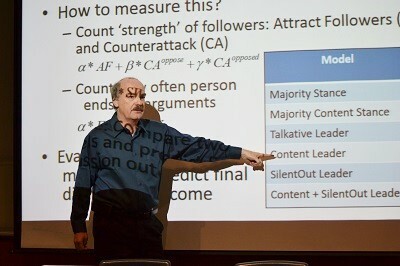 As the first keynote speaker at CCICADA’s 7th Annual Research Retreat, Fletcher set the tone for the remainder of the 3-day event, during which researchers presented leading-edge research in data-analytics and explained how it is already making the nation safer and more secure. They also discussed the vital role that data analytics will play in meeting the challenges of the future. The CCICADA research consortium uses advanced mathematics, computational models, and computer simulations to harness the power of big data to solve security problems. The retreat provided a rare opportunity for leaders in government, industry and academia to learn how rapidly the science of data-analytics has progressed over the past ten years, in part due to the ubiquitous spread of Internet communications. A highlight of the retreat were two panels of homeland security practitioners whose work has benefited from the application of CCICADA’s tools and technologies in real-world settings. One such panel included high-level representatives from the US Coast Guard, NJ TRANSIT Police Department, the FBI and a DHS program officer. David H. Boyd, who serves as chief of operations analysis with the US Coast Guard Pacific Area, described how CCICADA for many years has used data analytics to help the Coast Guard make more efficient use of its scarce human and physical resources by better allocating stations, manpower, boats, planes and helicopters. Other panels discussed what the future of homeland security research will look like and how CCICADA’s education programs are preparing a new generation of homeland-security researchers. The former panel involved two representatives of DHS Science & Technology, and representatives of the TSA, NJ Transit, and the NJ Office of Homeland Security and Preparedness. Among the topics discussed was a not-too-distant future where we will be more dependent than we are today on cyber-physical devices, including driverless cars. The Retreat’s education panelists explained how CCICADA’s multiple education programs have advanced their homeland-security research work and promoted their careers as homeland security professionals. It featured participants in such key CCICADA education programs as Research Experiences for Undergraduates (REU), Reconnect, the post-doctoral program, and the Graduate Student Fellows Program. In fact, Dennis said, “data analytics is at the core” of DHS’s “visionary goals” such as creating a secure cyber future that protects both personal privacy and commerce; providing actionable information to decision makers “at the speed of thought”; ensuring that emergency responders are “protected, connected and fully aware”; and “disaster-proofing society” by creating resilient communities. Mubbasir Kapadia, Assistant Professor of Computer Science at Rutgers University, made a compelling presentation on Modeling, Validating and Optimizing Crowd Dynamics, demonstrating how computer models can simulate and predict crowd movements at large venues like sports stadiums and the Port Authority Bus Terminal in Manhattan. The retreat also included a “poster session,” during which graduate students from six universities presented their research projects in a concise format using poster boards containing images and research highlights. More than 80 people (including many students) attended the retreat, representing multiple government agencies and 15 colleges and universities of which five were minority serving institutions (City University of New York’s City College, Howard University, Morgan State University, Texas Southern University, and Tuskegee University). 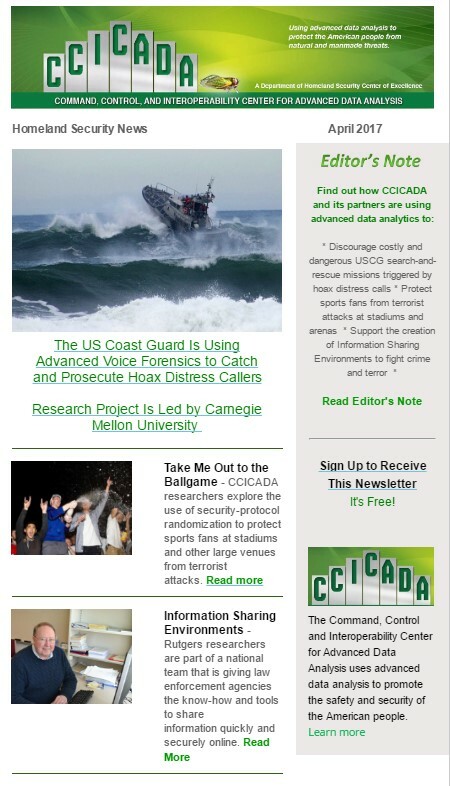 CCICADA plans to hold more events where homeland security officials, advisors and researchers can share their progress in making the nation safer and more secure from natural disasters, terrorist attacks and other security threats. See upcoming and recent events.